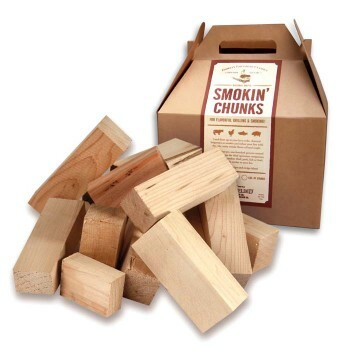 Grilled or smoked foods go gourmet with the rich, woodsy-smoke flavor of Emmet’s Epicurean Smokin’ Chunks. Natural hard sugar maple adds a sweet, nutty finish. From fish to fowl, veal to veggies – the flavor possibilities are limitless. Load these up in lava rock, among charcoal briquettes or in the smoker. The chunky size offers longer grilling and smoking times versus chips or pellets.